LONDON (Reuters) - Despite talk of crumbling and chilly palaces and of Queen Elizabeth slipping down several "rich lists", Britain's monarchy will be wealthier than ever when she becomes its longest serving royal on the throne -- 63 years -- on Sept. 9. According to a Reuters estimate based on the monarchy's interests in its key investment vehicle, royal estates and its trove of treasures, the British monarchy has nominal assets worth about 22.8 billion pounds ($34.8 billion). However, estimates of monarchy's wealth are complicated since some of the assets are privately owned while others, such as the Crown Estate, a sprawling investment vehicle which is the chief driver in the rise of royal wealth, are owned on behalf of the nation by the monarch for the duration of their reign. Buckingham Palace says the Crown Estate, which invests in and runs the monarchy's property and whose capital value has more than doubled to 11.5 billion pounds since 2005, does not belong to the queen. But a Buckingham Palace spokesman said the monarchy's increased funding was due to the Crown Estate's higher returns and this would be used to carry out repairs on the queen's many palaces. Other key sources of royal wealth are the Duchies of Lancaster and Cornwall, two vast private estates valued together at 1.3 billion pounds. The Royal Collection, the monarchy's centuries-old store of treasures, is valued at 10 billion pounds by Brand Finance, a consultancy which said it put the monarchy's overall tangible assets at 20 billion pounds. Both Reuters and Brand Finance's estimates exclude the unknown value of splendid royal residences such as Buckingham Palace, Windsor and Balmoral. Separating what belongs to the current individuals who make up the royal family and the trappings accumulated by an ancient institution over the last 1,000 years is not straightforward, a factor most clearly demonstrated by the Crown Estate. The commercial company owns a trove of London property, including about half of the buildings in the exclusive St James's area of central London, along with almost the entire seabed in British waters. It is the property equivalent of the crown jewels, says the Crown Estate's website, part of the national heritage and held by the queen as sovereign, but not available for her private use. "You would be hiding behind nomenclature and history to suggest that the Crown Estate is in any way an asset of the queen's," the palace spokesman said. The queen's public income - known as the Sovereign Grant, although not funded directly from the Crown Estate, is based on a calculation of 15 percent of the Crown Estate's annual profit in the financial year two years previously. All profit is first paid to the British Treasury. The Sovereign Grant for 2015 was 37.9 million pounds, 22 percent more than two years before. The Crown Estate's net profit growth was slow during the initial decades of the queen's reign - profits in fact declined by 19 percent between 1962 and 1982 in real terms - but it accelerated with the London property boom of the late 1980s. Since the 2007 global financial crisis, the Crown Estate's property value has more than doubled to 11 billion pounds, increasing at an annualized rate of 9.3 percent at a time when the rest of the British house market, even in London, slowed. "Over the last decade the business has moved from being a traditional landed estate to an active investor and developer," said a spokesman for the Crown Estate, which posted a record net annual profit this year of 285.1 million pounds. Crown Estate land has swelled since the early years of the queen's reign. Its archives note that it now owns 60,000 acres more than the 280,000 acres it owned in 1958. Added to the land owned by the duchies of Lancaster and Cornwall and the queen's private Balmoral and Sandringham estates, the monarchy has almost as much land as Britain's Ministry of Defense with about 600,000 acres. The royal wealth is bolstered by the Duchy of Lancaster and the Duchy of Cornwall, two ancient private estates which have been passed down over the centuries between royal households. The Duchy of Lancaster, an estate of 45,549 acres in England and Wales established by King Henry III over 700 years ago, earned the queen 13.3 million pounds in private income, termed the privy purse, over the 2014 financial year. Its fortunes have been less dramatic than the Crown Estate over the last decade, but its capital value has kept pace with the rise in farmland prices since 2000, more than doubling over the period to a record 472.1 million pounds. Prince Charles, the queen's 66-year-old son and heir to the throne, draws his own income from the Duchy of Cornwall, a private estate given to the eldest son of the monarch. Founded in 1337, the Duchy of Cornwall valued its 53,400 acres also at a high point of 871 million pounds in March. Neither the Duchy of Cornwall or Lancaster pays corporation tax as the monarchy says they are private estates not firms, however the queen has paid standard income tax since 1993. The monarchy has also published annual accounts since 2001 in a bid to make the royal finances more transparent. Despite that, the queen's private funds, as opposed to the monarchy as a whole, remain a subject of speculation. "The queen's wealth is hidden in smoke and mirrors," said Philip Beresford, the author of an annual rich list published since 1989 by the Sunday Times newspaper. "Where is the line drawn?" This year the queen fell out of the Sunday Times rich list's top 300 richest people in Britain with an estimated 340 million pounds. Estimates of the queen's private wealth typically include her private estates of Balmoral and Sandringham and a 110 million pound investment portfolio, unearthed by the Sunday Times 20 years ago, that was in mostly blue-chip British companies. Such estimates are stabs in the dark, said Beresford, and the wealth of other royal institutions is similarly murky. The true worth of the Royal Collection, which includes thousands of treasures by artists such as Rembrandt, Poussin and Renaissance master Leonardo da Vinci, is unknown. Brand Finance marketing director Robert Haigh said they used a rough average of a collection of estimates by art experts for their figure of 10 billion pounds but said that without a market it was "effectively priceless". The Crown Jewels, which compile the treasures of past British monarchs and form part of the Royal Collection, are similarly priceless and boast the largest flawless cut diamond in the world, the 530-carat First Star of Africa. Despite all these riches Beresford said the monarchy has no appetite for lavish displays of wealth. 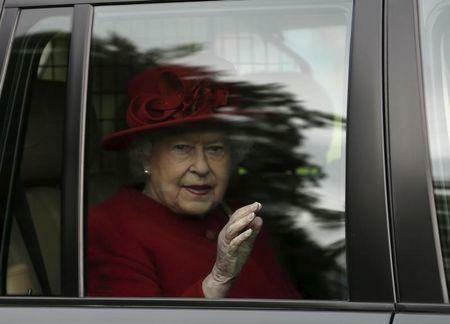 "The queen is extraordinarily frugal as a person," he said. "The most she's into are a few race horses."